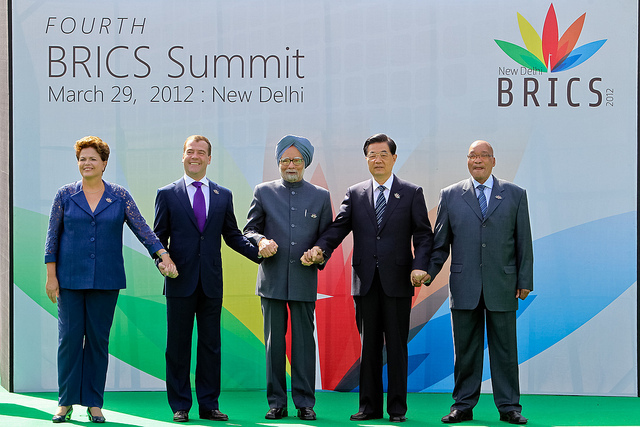 The ‘BRICS’, referring to the nations of Brazil, Russia, India, China, and South Africa, is a cooperative group of nations in global and economic affairs. 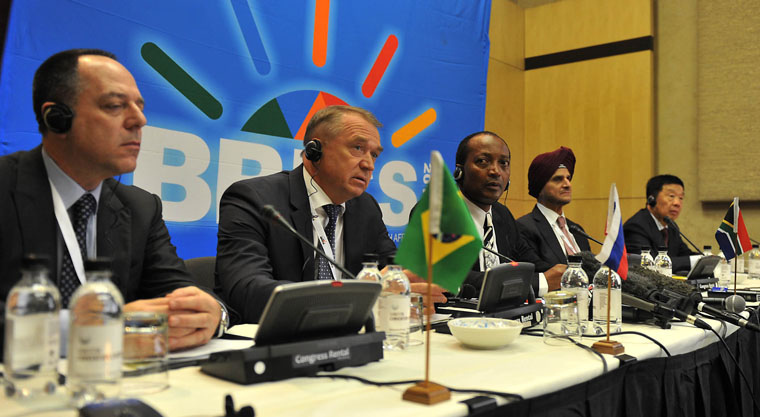 The importance of BRICS has increased, from adding South Africa in 2010, to a vision of a new Global South-led development bank which was publicly finalized at the 2014 BRICS Summit (TBC) in Brazil. However, given the ongoing situation between Russia and Ukraine – Brazil, India, China, and South Africa, because of their relationship to Russia, have found themselves in an awkward position. Whatever disputes they might have with Russia’s behaviour, they cannot risk upsetting an ally. Therefore, B[R]ICS will, most likely, side with Russia on many issues, whether implicitly or explicitly. Ukraine’s attempt to get closer with the European Union (EU) were interrupted by President Vladimir Putin’s desire to create an alternate Eurasian Union, a regional system which would necessarily include Ukraine, echoing the Soviet Union of the past. However, so far, Russia has failed in gaining control of Ukraine. Putin’s next gambit, after failing to keep his ally President Viktor Yanukovych was to seize Crimea, a region whose population is 60% ethnically Russian. On March 16, Crimea ‘seceded’ from Ukraine and joined Russia, after what many called a flawed referendum. Crimea, as well as being a point of national pride, contains the strategic port of Sebastopol, home of Russia’s Black Sea Fleet and a key asset to the Russian military. For that reason, it is not surprising that the B[R]ICS, expecting victory for Russia, would prefer quiet diplomacy vis-à-vis the ongoing strife. They are also wary of their own interests. For example, as with Russia, they will avoid coming into direct confrontation with powerful Ukrainian allies, such as the United States, the EU, or Canada.
. Putin retained the right to protect its interests and Russian-speakers living in Ukraine. Chiefly, BRICS ought to consider an amalgamated response system through which they can address emerging crises and avoid contradictions. They cannot wait for their annual summits to express beliefs on international affairs, especially when such events can be postponed — as was recently the case with Brazil, to avoid conflict with the 2014 FIFA World Cup. BRICS face some challenges in doing so. First, they are a relatively new and disparate group, with little experience or strategy on how to address major world developments as a collective. This is especially difficult when a fellow member is involved. While talks may occur in private, individual member responses have not been cohesive. Secondly, given Russia’s powerful stature and presence within the group, it will be very difficult for others to take on the aging giant. Although such groups may preach international fairness, equality and self-determination, it is quite natural that power dynamics would play out instead, even within the group. BRICS cannot release a joint statement that is not subjected to the Kremlin’s or Beijing’s vetting. Third, and perhaps most important, is the issue of organization. Previously, BRICS preferred offering major declarations or releasing group statements on world affairs, such as Syria or Libya, at their summits or at smaller, occasioned, gatherings. It reflects badly on BRICS’s operations system to be withholding influential opinions or delaying public announcements. To become more influential, the group must be seen to be in action. Otherwise, to some, the BRICS might seem to be a group meeting annually, for cheese and wine, with no concrete achievements or goals. BRICS must sustain itself as a fully functional, fit multilateral institution, with the ability to swiftly respond to arising challenges. Once organized, they can communicate their world views effectively. Quiet diplomacy, for a group in the power and size of BRICS, cannot work. BRICS members, such as Brazil and South Africa, who prefer soft power, are finding themselves in very difficult situations, with troublesome implications, as exemplified by Russian presence in Ukraine. To set a positive precedent, and to be a successful group, BRICS will need to address these concerns.